I think these figures show I have been quite focused the past year. 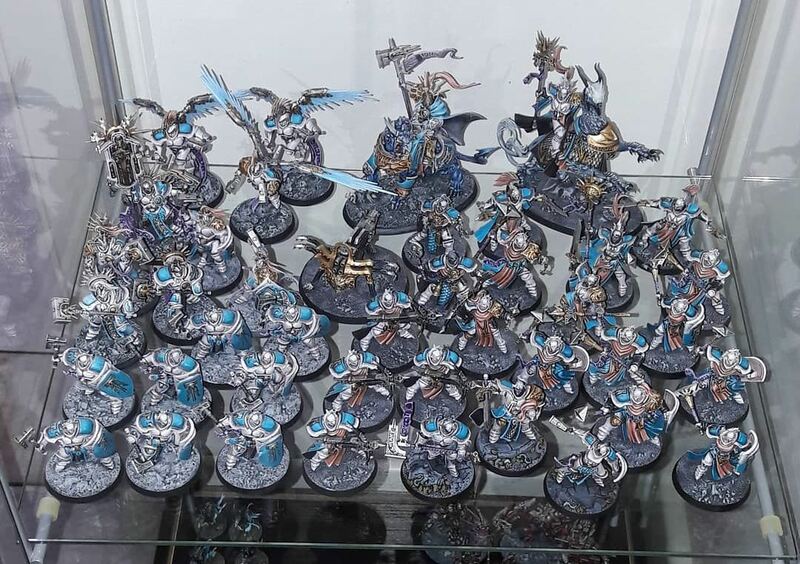 I finally finished the first edition Age of Sigmar starter set, just in time for the release of Soul Wars, which basically occupied most of my painting time in the second half of the year. At the time of writing it’s nearly finished, with only one miniature left! What I also finished was the Shadespire starter set. 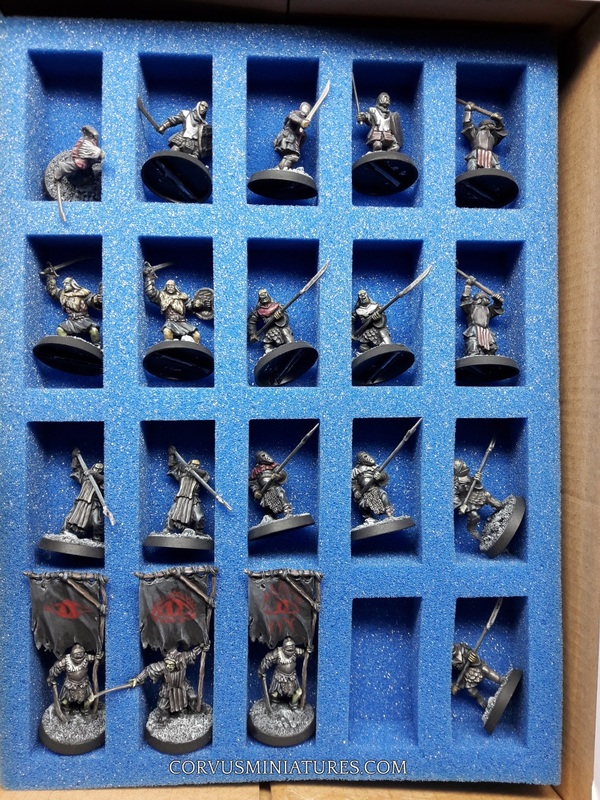 The bulk of my Lord of the Rings army was laid out in 2017. I expanded a bit on it last year, but not as much as I would have liked. The Infinity miniatures are all commissions I did for the same customer. He supplies me with some challenging assignments from time to time, with enough time in between to allow me to work on my own projects. I am very happy with the results being so consistent. Basically there weren’t any hiatuses last year. Especially the work on the Soul Wars set I am pretty proud of. So what will the next year bring? First of all bring my Age of Sigmar stuff together. What I mean by this is taking good overview pictures of the armies and secondly playing a few games. For this I invested in a game mat and some scenery (which I still need to paint). Another upcoming project is the Pelennor Fields set from Lord of the Rings which I bought in September when it was released. This will be my main focus in the coming months. Next to that there are more Infinity miniatures on their way. I don’t consider these resolutions but I am planning on breathing new live into my YouTube channel and also write more on this blog. I hope your past year was also a success and that you have some good plans for 2019. Thank you for reading this! Time flies! A couple of weeks ago I was still enjoying my summer holiday in very nice weather and today the weather is cold, stormy and the first signs of autumn are already showing. Time to catch up on what’s been happening on my painting desk since the last update! 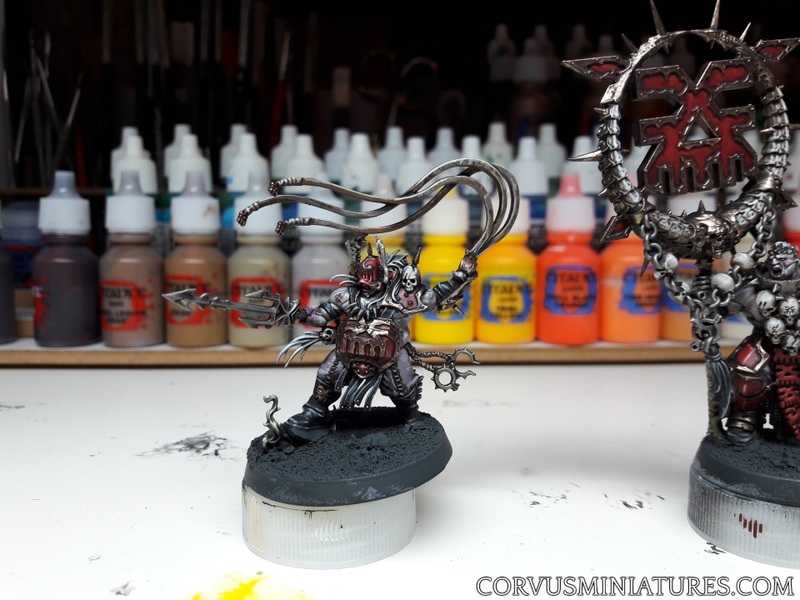 First some Age of Sigmar updates. It’s now been two years since I started working on the starter box (on and off of course). All Stormcast Eternals are done, so since the last update I finished painting the Retriutors and Prosecutors (you might have seen the pictures on my Instagram account). Soon it will be time to rank them all up for a big photoshoot, promised. 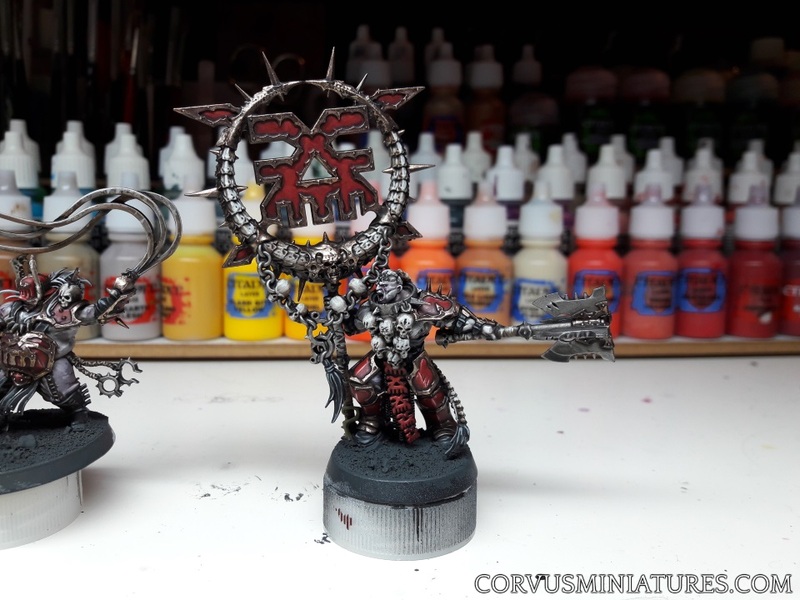 The last twee weeks I spent time on the two Khorne models you see below. After these are done there are only 5 models left to do (including the big Khorne monster which is a sculpt I don’t really like to be honest). I also added some standard bearers and a captain (not pictured here). Speaking of LotR the guy below arrived in the mail today. It’s a Mordor character named Kardush the Firecaller. It’s an OOP metal model, the kind which you can sometimes find on eBay for 50-60 EUR if you’re lucky. I managed to pick this one up on a local second hand site for 15 EUR or so. The only problem is that his staff is broken, but the bit is supplied together with the model and it’s a clean cut so easy to fix. At the moment of writing an exiting commission just came in, but that’s something for a next blog post. Take care! In November last year I reported about my painting gear being packed up and stored. For the last 5 months we’ve been working on our house renovation project like crazy and last weekend all that hard work finally paid off. We moved out of our temporary living/dining room and occupied our new and improved living room and kitchen. As you might notice the desk is placed in the corner where my other desk (used for storage and assembly) was originally located. 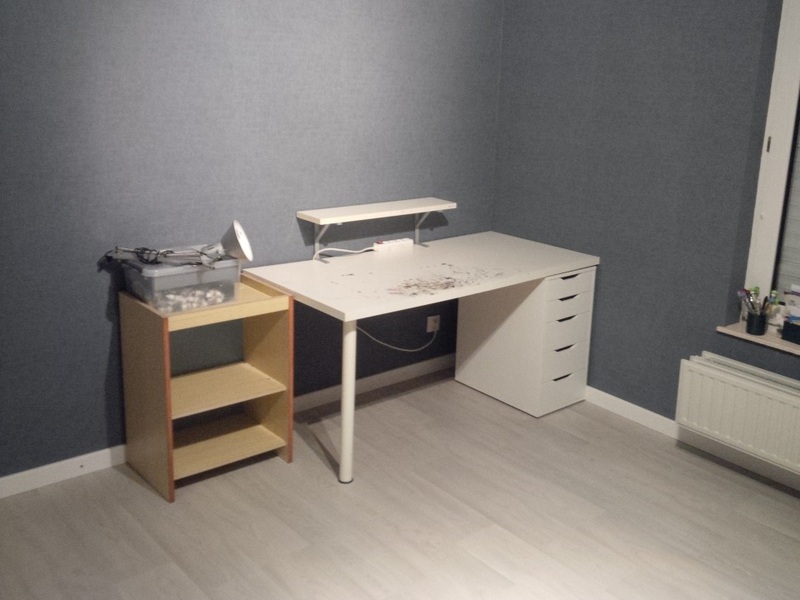 This desk was mainly just storage so I will look for an alternative solution for this (probably some shelves agains the wall). Apart from that I want to invest into a paint storage system instead of my home-made paint stand. 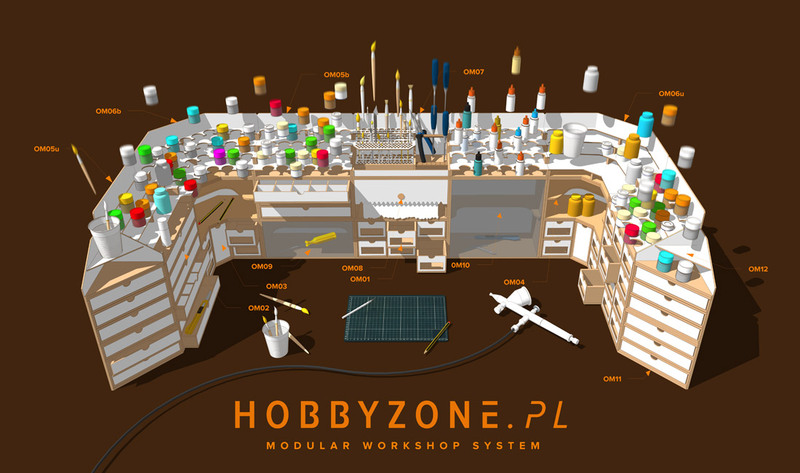 I am currently looking to HobbyZone’s modular system. Good job looking up my new website, however this is still a work in progress. 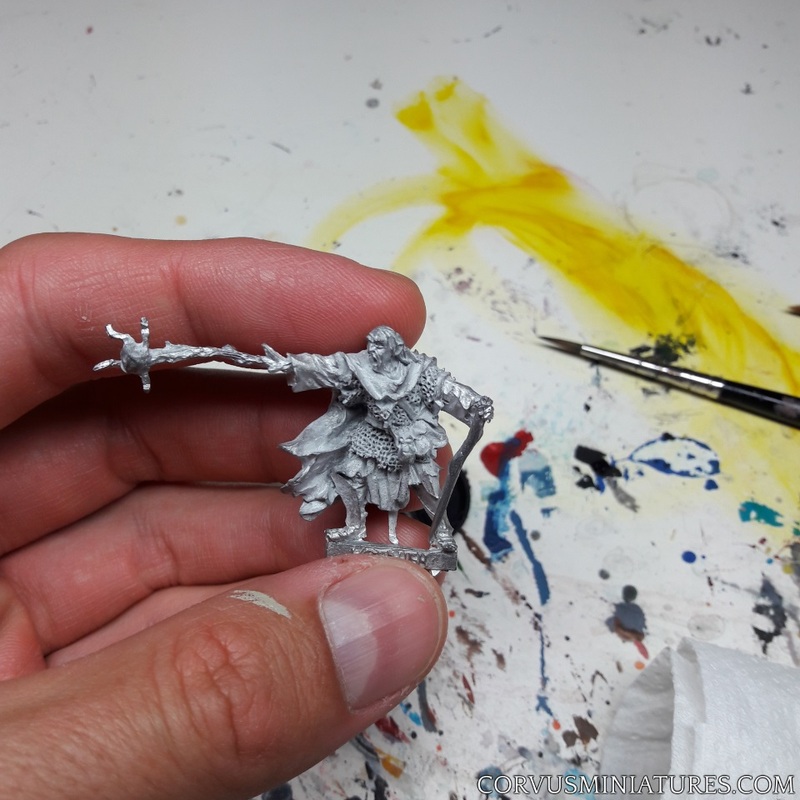 Currently all the action is still going on at corvusminiatures.blogspot.com, this is where I will also post when the new site is finished. Thank you & see you again soon!